For years, the city’s annual style extravaganza has been held in clubs and hotels. This year, it finally gets a tent (and runway) to call home. 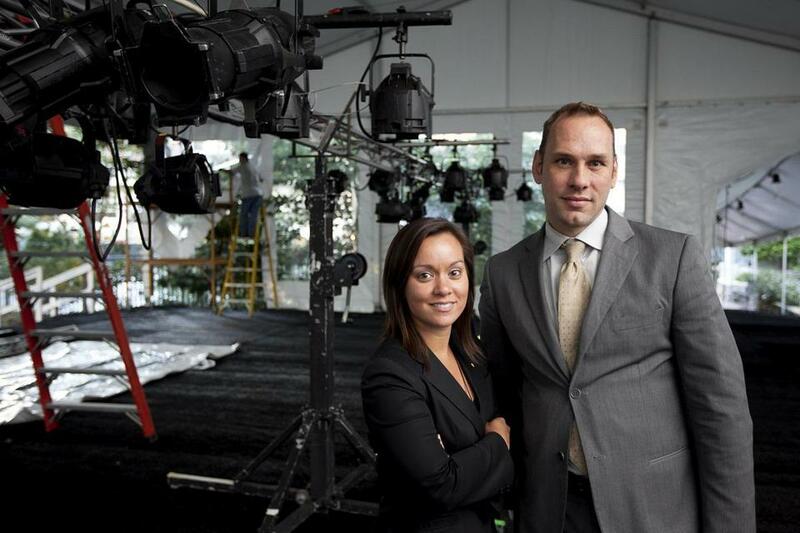 The Mandarin Oriental Hotel’s Edwina Kluender (left) and Mark Schwindenhammer. From left: designer Daniela Corte and her creative director Ricardo Rodriguez, Dress Code Boston’s Jeff Lahens, designers Tonya Mezrich and Daniel Faucher, Lily & Migs co-owner Lauren Antos, and designers Candice Wu, Karina Bresnahan, Carter Smith, GeorgAnnette Chatterley, and Christine Lam. Galvin, who runs GALVIN-ized Headwear, wasn’t the only one frustrated with Boston’s fragmented Fashion Week. Shows took place at clubs and hotels across the city, which made it challenging to attend multiple shows in an evening. It also meant the quality of presentations varied wildly. But a new era in local fashion begins tomorrow as Boston Fashion Week inaugurates its temporary home: a 3,000-square-foot tent situated between the Prudential Center and the Mandarin Oriental Hotel. Through Sept. 30, models will swish down the runway wearing frocks by local designers as audiences take it all in. Galvin couldn’t be more excited. “Everyone looks a million times better when there’s proper lighting, a proper runway, and proper seating,’’ she said. While Boston Fashion Week director and founder Jay Calderin heartily endorsed the tent and has given his organization’s seal of approval to the venture, the tent - officially dubbed the Tent at Boston Fashion Week - is actually the result of a partnership between the Mandarin, Boston Properties (which owns the land where the tent is situated), Boston magazine, and Party by Design. This is the group that raised the funds to pay for the tent, which went up last week. Initial estimates put the cost of the tent at $65,000. The final cost of the project has roughly doubled since that estimate was made last spring, according to a source involved with the event. But Edwina Kluender, director of public relations for the Mandarin, said that corporate sponsors, as well as individual donors, have been generous in their contributions. Tent organizers are encouraged that big-name sponsors such as Land Rover, Stella Artois, and Vitamin Water Zero have stepped up for the tent’s first year. Though construction of the elaborate tent is nearly complete and organizers say all is running smoothly, Lisa Baker, the operations manager for the tent, concedes there are naysayers on the local fashion scene who anticipate that the newly centralized Fashion Week will be a bust. 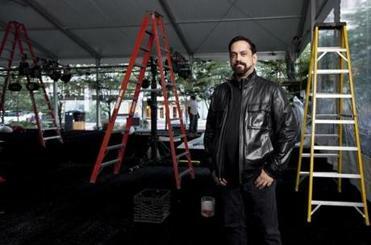 Boston Fashion Week director and founder Jay Calderin inside the event’s new home. Also at issue are a few designers who are grousing at the cost of showing at the tent. Corporate participants are paying $3,500 to show at the tent. Established local designers are being asked to pay $2,000, while new designers, who will open the festivities each night, will show their collections for free. Meanwhile, designers who’ve been showing their collections at clubs are having to adjust to the strict deadlines of presenting at the tents. Some are hesitant to hand over artistic control of hair, makeup, and models, all of which are covered in the $2,000 cost. Calderin says Boston designers are accustomed to the looser format of organizing their own shows. Presentations at the tent are being tightly organized. Designers are required to submit seating charts and must also show at least 12 looks on the runway. Several participating designers interviewed seemed excited about the new opportunity. Jeff Lahens, style curator at Dress Code Boston, said this is the most buzz he’s heard surrounding Boston Fashion Week. Tonya Mezrich, who will be debuting Mike & Ton, a collaborative line with Michael De Paulo, is also enthusiastic. “The tent is just the natural progression necessary to make Boston an even more metropolitan city,’’ Mezrich said. Still, not all of Boston’s best-known designers will be showing at the tent. Nirva Derbekyan will stage her show next month, while designer Sam Mendoza put his collection on film and screened it earlier this month at Fashion’s Night Out. None of the organizers expect the week will be without flaws. Corte, who will show Sept. 30, said despite the anticipation and hype, mistakes are going to be unavoidable. But nearly everyone involved agrees that a central, high-profile location is an important step for the city and its reputation.